Every poll in Stanislaus County has an AutoMark Voter Assist Terminal, which is designed to assist voters with disabilities and other special needs. This is one way the County Clerk-Recorder’s Elections Division has been focused on meeting the mandated requirements associated with the Help America Vote Act (HAVA). The AutoMark allows voters with disabilities and other special needs to mark a ballot privately and independently. The technology was developed based on input from elections authorities and disabilities organizations. This machine reads and marks ballots. It does not count or store votes. The AutoMark sits on a table with room for a wheelchair. It can be used standing or seated. The angle of the screen is easily changed, too. 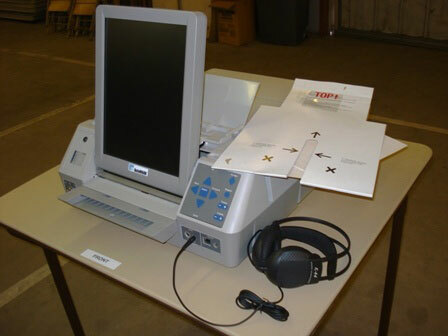 After a ballot is inserted, the machine scans the type and shows it on a screen. It also reads the ballot aloud in English or Spanish. VISUAL: A voter may enlarge the type or choose a high contrast background. The machine has instructions in Braille. AUDIO: A voter may use headphones to listen to the ballot, adjusting the language, volume and speed as needed. All polls have English and Spanish audio. A voter can easily replay the audio if needed. PHYSICAL: Touching the screen to vote may be easier for some voters than trying to mark a ballot with a pen. The AutoMark makes it easy to correct a vote without spoiling the ballot, too. Any voter may use the AutoMark, and in fact many voters find they prefer using it. The AutoMark is as easy to use as an ATM; you can review and change your selections without spoiling a ballot. It will alert you if you skipped a race or didn’t vote for two in a “vote for two” race. The system can accommodate write-in candidates as well. Use of the AutoMark is intended to achieve the Board of Supervisors’ priority of efficient delivery of public services and to meet federally mandated voting requirements. Stanislaus County voters cast their ballots at the polls on the Model-100 precinct-based, voter-activated, paper ballot count tabulator. Each poll has a Model-100. After marking the ballot, each voter personally and confidentially inserts their voted ballot into the Model-100, which sits directly over the ballot box. To promote ballot integrity and voter intent, the Model-100 alerts the voter to an over-voted race and an under-voted ballot before accepting the ballot. Then the Model-100 tabulates the voted ballot. 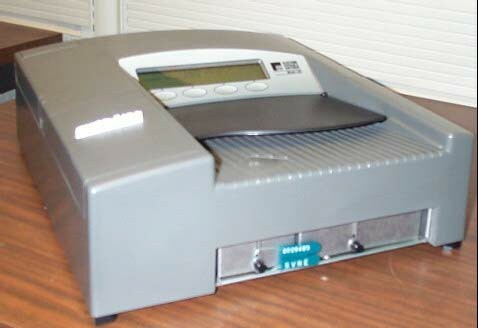 The Model-100 has been certified by the United States federal government, the State of California and is used in thousands of elections worldwide.